Joey and Erich combined to go 11-for-12 as Joey went 6-for-6 with four doubles and Erick went 5-for-6 with three home runs in the 11-1 Cookies & Cream win over Eastbound & Dahn. Guthrie pitched the complete game win for Cookies & Cream, allowing only a single run, and Cookies & Cream clinched the #2 seed in the 2017 EWL playoffs. Guthrie retired the Eastbound side in order in the top of the first, and Cookies would get on the board early in the bottom of the inning. Erich hit a one-out triple, and he scored when Joey followed with an RBI double that made the score 1-0. Christian, Eastbound & Dahn’s starter, then retired Guthrie to end the inning. Eastbound evened things up in the top of the second. Adam singled with one out, and BK followed with an RBI double, scoring Adam from first to tie the game at 1-1. Guthrie then retired Nate O, ending the inning. Cookies bounced right back in the bottom of the second, taking the lead back. Christian retired Jordan for the first out of the inning, but Erich followed with a solo homer, putting Cookies ahead 2-1. Joey then doubled, and scored when Guthrie followed with an RBI double to make the score 3-1. Christian retired Jordan to end the inning, and Cookies led by two. It looked as if Eastbound would threaten in the top of the third, but they couldn’t capitalize on their base runners. Nate C singled with one out, and he moved to third on an Adam double, putting the tying runs in scoring position. Guthrie buckled down, however, retiring BK to strand both runners, and the score remained 3-1. Cookies would open up a big lead in the bottom of the third. Joey doubled with one out, and he scored from second on Guthrie’s RBI single, making the score 4-1. Jordan then tripled, scoring Guthrie and putting Cookies ahead 5-1. Erich followed with a two-run blast, his second homer of the game, and Cookies & Cream led 7-1. Joey followed with his fourth double in as many at-bats, but the big inning would end there, as Christian retired Guthrie for the second out, stranding the runner. Down six runs, Eastbound went down in order in the top of the fourth, and Cookies would extend the lead even further in the bottom half of the inning. Jordan singled, and Erich followed with his second consecutive two-run homer, putting the Cookies & Cream lead at 9-1. Joey then made it back-to-back homers, and his solo shot made the score 10-1. Guthrie followed with a double, and two batters later, Erich hit an RBI single with one out to push the lead to 11-1. Erich was caught trying to extend the hit into a double, ending the inning. Adam singled with one out in the top of the fifth, but Eastbound couldn’t advance him, as Guthrie retired BK to strand the runner and end the inning. Joey singled to start the bottom of the fifth, but the Cookies lead would remain at ten runs, as Christian retired Guthrie and Jordan to end the inning. Down ten, Eastbound went quietly in the top of the sixth. Guthrie retired Nate O and Christian to end the inning and the game, and Cookies & Cream defeated Eastbound 11-1 in their final matchup of the 2017 season. 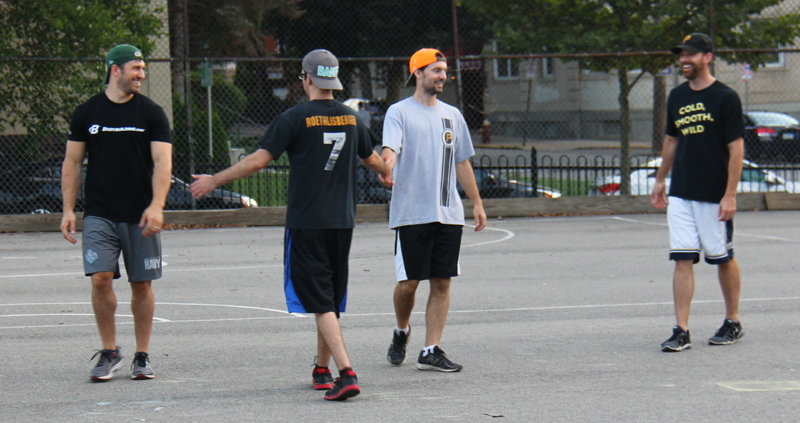 The win moved Cookies & Cream to 11-8 for the season, and the loss dropped Eastbound & Dahn to 2-17. – Guthrie pitched the complete game win for Cookies & Cream, allowing one run on five hits in six innings. – Christian took the loss for Eastbound, giving up eleven runs on sixteen hits in five innings pitched. – Joey led Cookies & Cream on offense, going 6-for-6 with a single, four doubles, a home run, three runs scored, and two RBI. – Erich also went 5-for-6 for Cookies, with a single, a triple, three home runs, four runs scored, and six RBI. 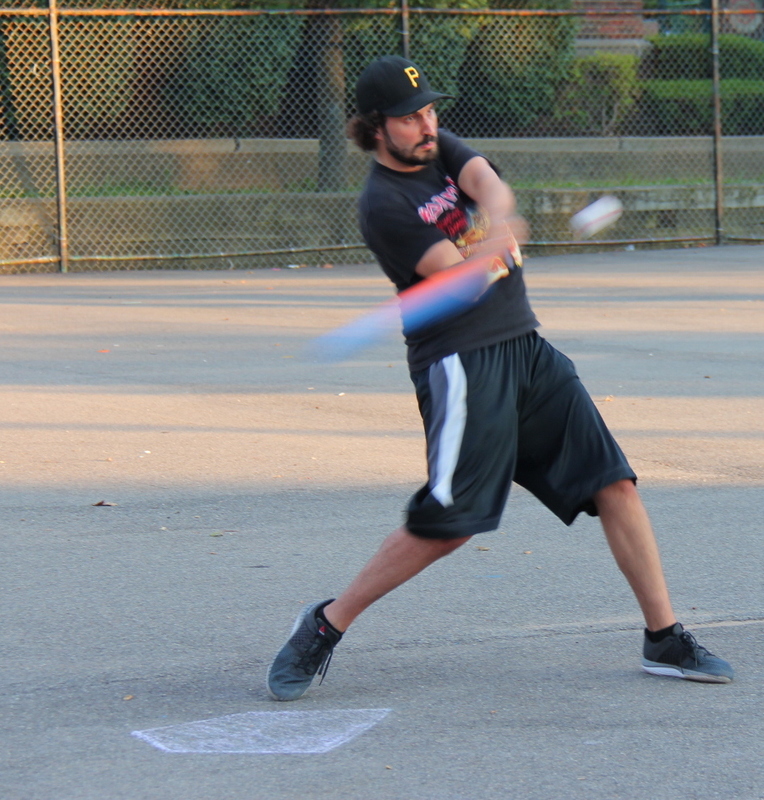 – Adam led Eastbound & Dahn at the plate, going 3-for-3 with two singles, a double, and a run scored. 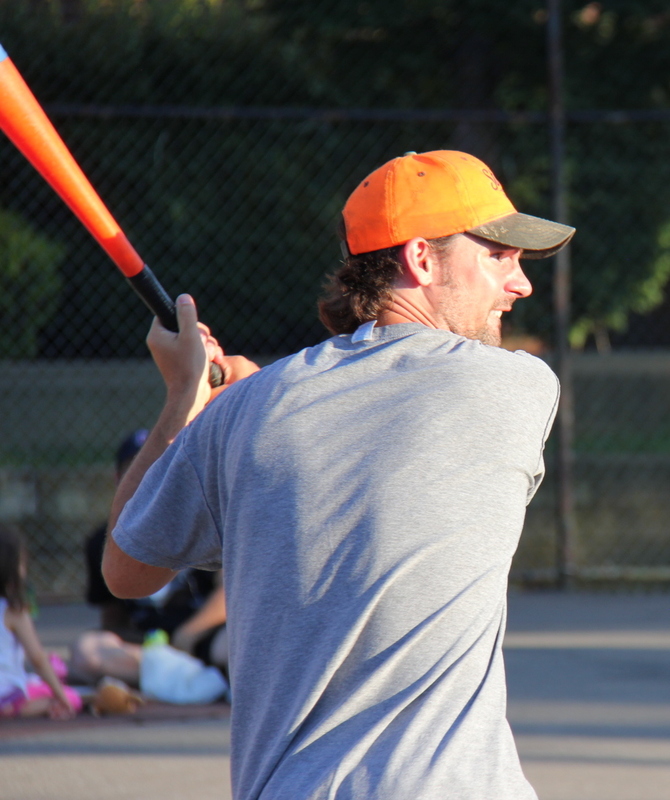 Bob hit for the cycle and went 5-for-7 with a single, a 2 doubles, a triple, a homer, 3 runs scored, and 3 RBI. 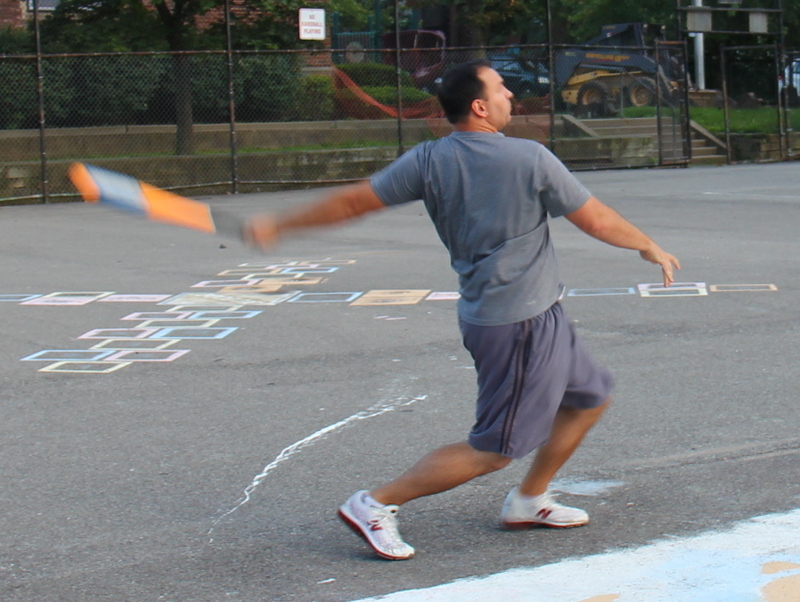 He scored two runs in the bottom of the sixth when Questionable Outfit stole the pennant from Cookies & Cream. 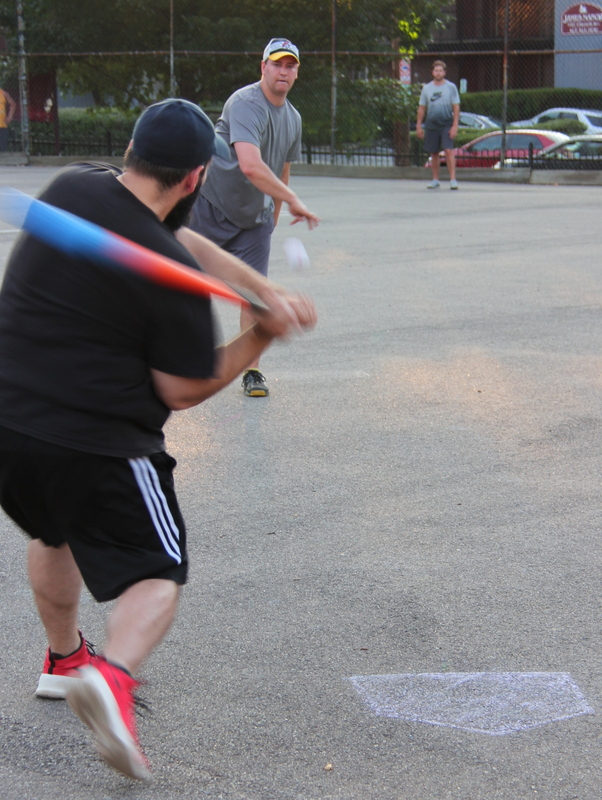 Cookies & Cream had dominated Questionable Outfit, led 6-1, and were two outs away from clinching the 2016 EWL regular season pennant when they began to choke in historic fashion. 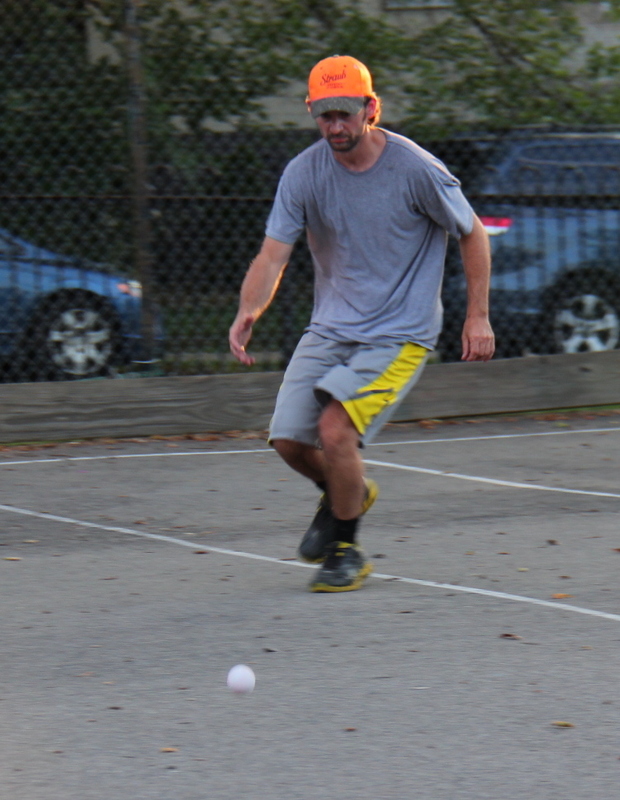 Questionable Outfit put together six consecutive hits, largely fueled by Cookies & Cream fielding errors, and scored six consecutive runs to walk-off with a 7-6 victory, the pennant, and the #1 overall seed for the fourth consecutive season. Coming into the game, Cookies & Cream had been chasing Questionable Outfit the entire second half of the season. 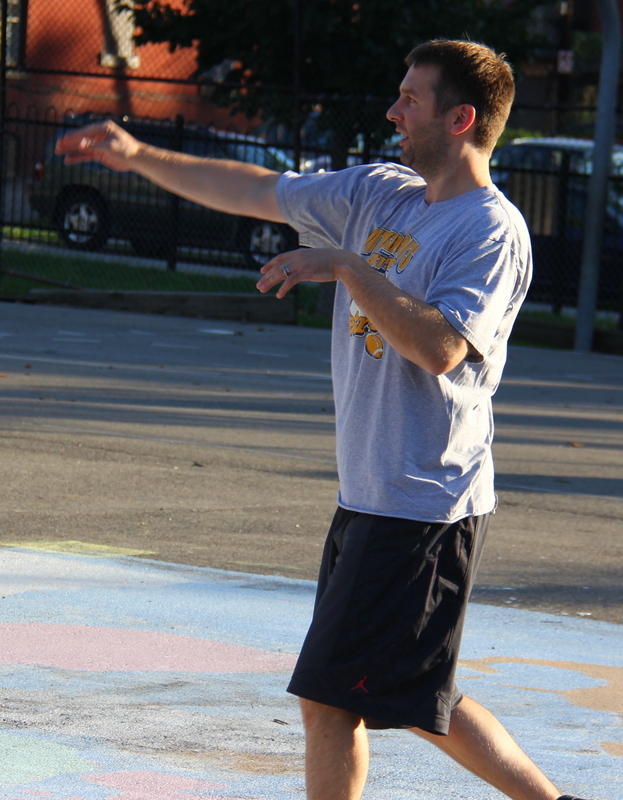 Cookies had won seven consecutive games, including two straight against Questionable that had evened the season series at 3-3 heading into their final showdown. After finishing the first half 6-4, Cookies were 8-1 in the second half. Questionable Outfit had gone 8-2 in the first half of the season and 7-2 in the second half, but had struggled against Cookies & Cream, and the seventh matchup between the two teams would break the tie for their season series, their place in the standings, and would decide the pennant. 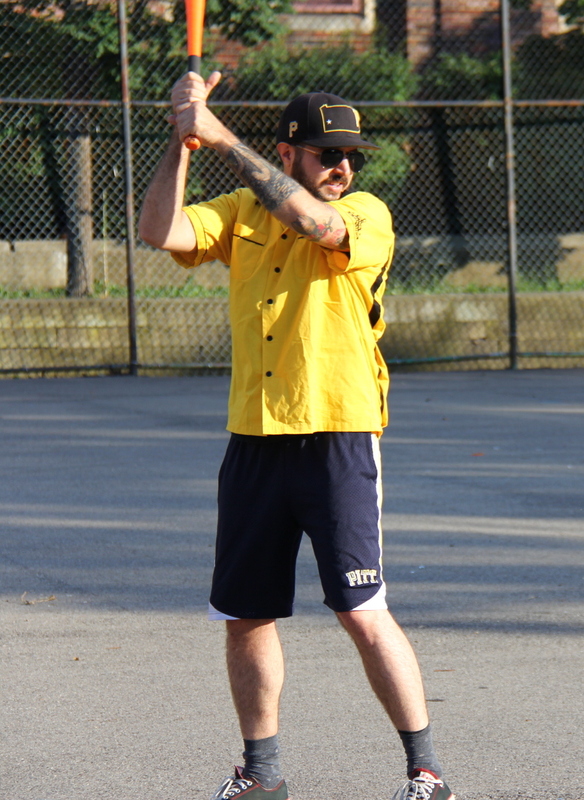 Questionable Outfit would employ a unique strategy against Cookies, rotating pitchers depending on who was at-bat. Miller got the start for Questionable, but Bob would rotate in to face certain batters throughout the game. Miller retired the first batter he faced, Guthrie, and after Blose followed with a double, he was caught in between second and third for an out, ending the inning. 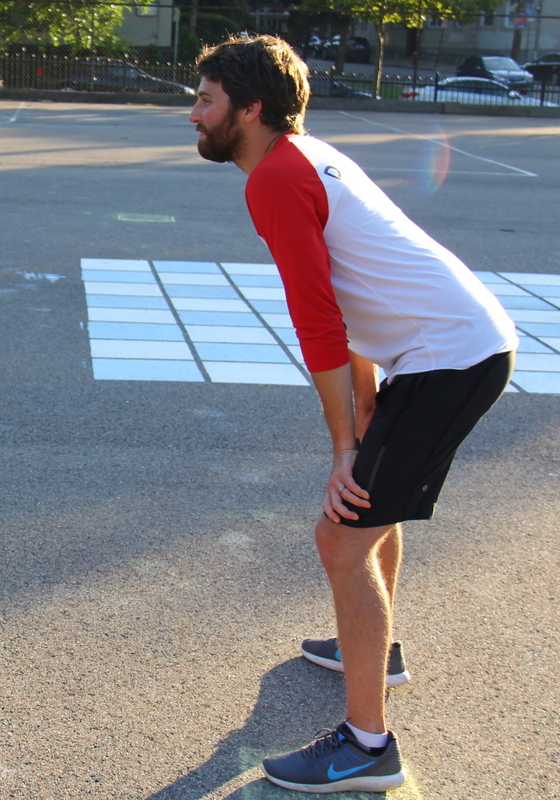 Joey, who had recent success against Questionable Outfit on the mound, was named the starter for Cookies & Cream. He retired Bob and Tom in order in the bottom of the first, and the game was scoreless through an inning. Cookies would get on the board in the top of the second. Joey led off with a double, and he scored when Dinger followed with an RBI double that made the score 1-0. Jordan then singled, scoring Dinger from second to put Cookies ahead 2-0. Miller then struck out Guthrie and retired Blose to strand Dinger and end the inning. Questionable cut into the deficit in the bottom of the second when Bob hit a one-out solo homer off Joey, making the score 2-1. Joey then retired Tom to end the inning. Bob retired the side in order in top of the third, getting Joey and Dinger to each fly out. Bob tripled with one out in the bottom of the third, but Questionable couldn’t tie the game, as Tom was retired to strand the runner and end the inning. 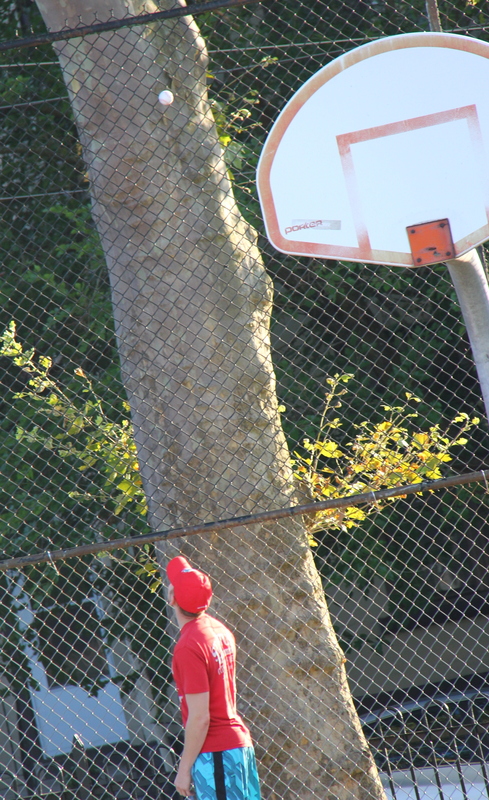 Bob approaches a ground ball in left field. Cookies extended their lead in the top of the fourth. Guthrie singled with one out and moved from first to third when Blose followed with a single. Joey then hit an RBI double, scoring Guthrie to make the score 3-1. Cookies had two runners on scoring position and had an opportunity to take a big lead, but Bob got Dinger to fly out to right, stranding both runners and ending the inning. Bob doubled with one out in the bottom of the fourth, but once again Cookies stranded the runner, retiring Tom to end the inning with the score 3-1. Cookies provided Joey with a few more insurance runs in the top of the fifth. Guthrie singled with one out, and Blose followed with a two-run bomb to left-center, putting Cookies ahead 5-1. Joey followed with a double, but Bob avoided further damage, getting Dinger to fly out to the mound to end the inning. Miller singled to start the bottom of the fifth, but Questionable couldn’t plate the run, as Joey retired Bob and Tom to end the inning, and Cookies had a four run lead. Jordan provided Joey with the final run of support in the top of the sixth, leading off the inning with a solo blast to left off Miller. Miller then retired Guthrie and Blose to end the inning, and Cookies and Cream led by five runs and were two outs away from securing the 2016 pennant with their eighth straight win. Miller started the bottom of the sixth with a single, and he moved to third when Bob followed with a double. Tom then singled, but no runs scored, and the bases were loaded with no outs. Miller singled on a fielding error, scoring one run, and Questionable trailed 6-2. 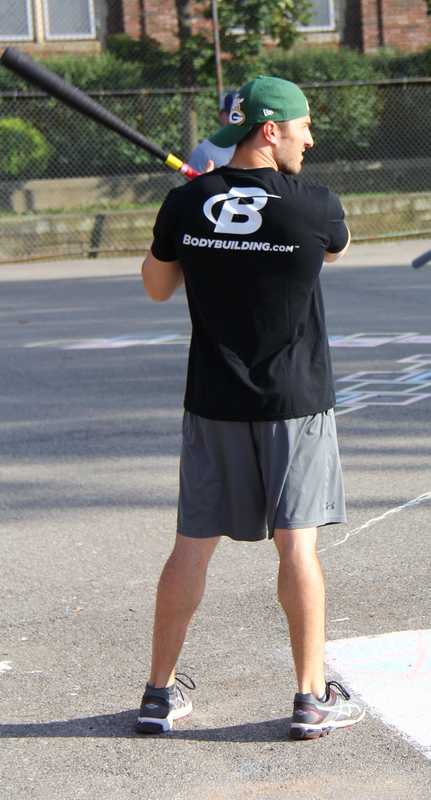 Bob then followed with a single, completing the cycle. Two runs scored on the plat, and Questionable had cut the score to 6-4 and had two runners on with no outs. Tom followed with a double, scoring one, and the first six Questionable Outfit hitters had reached base safely in the bottom of the sixth. The score was 6-5, Questionable had the tying and go-ahead run on base, both in scoring position, and Miller was at the plate. Miller hit a ground ball to deep left, which Blose fielded for the first out. Bob easily scored from third on the play to tie the game at 6-6. Blose gunned the ball into the mound to try to get Tom out, but the throw was errant, and Tom raced around third to score the game-winning run. Questionable Outfit had completed an improbable comeback, Cookies & Cream had collapsed unlike any team had in EWL history, and Questionable Outfit had won the game 7-6. Questionable Outfit moved to 16-4 on the year, and claimed the 2016 EWL regular season pennant. They will host the #4 seed Eastbound & Dahn in the first round of the EWL playoffs. Cookies & Cream finished the regular season 15-5, earned the #2 seed, and will host the #3 seed Ham Slams in the first round of the playoffs. – Miller earned the win for Questionable Outfit, giving up 4 runs on 7 hits and striking out one in 3.5 innings. – Bob pitched 2.5 innings of relief, allowing 2 runs on 4 hits. – Joey pitched the complete game loss for Cookies & Cream, surrendering 7 runs on 10 hits in 6 innings. – Bob led Questionable Outfit on offense, hitting for the cycle while going 5-for-7 with a single, 2 doubles, a triple, a home run, 3 runs scored, and 3 RBI. – Joey led Cookies & Cream at the plate, going 3-for-4 with 3 doubles, a run scored, and an RBI. Miller earned his first career save, closing out the win for Questionable Outfit. He also went 4-for-6 at the plate with a single, a double, and two triples. 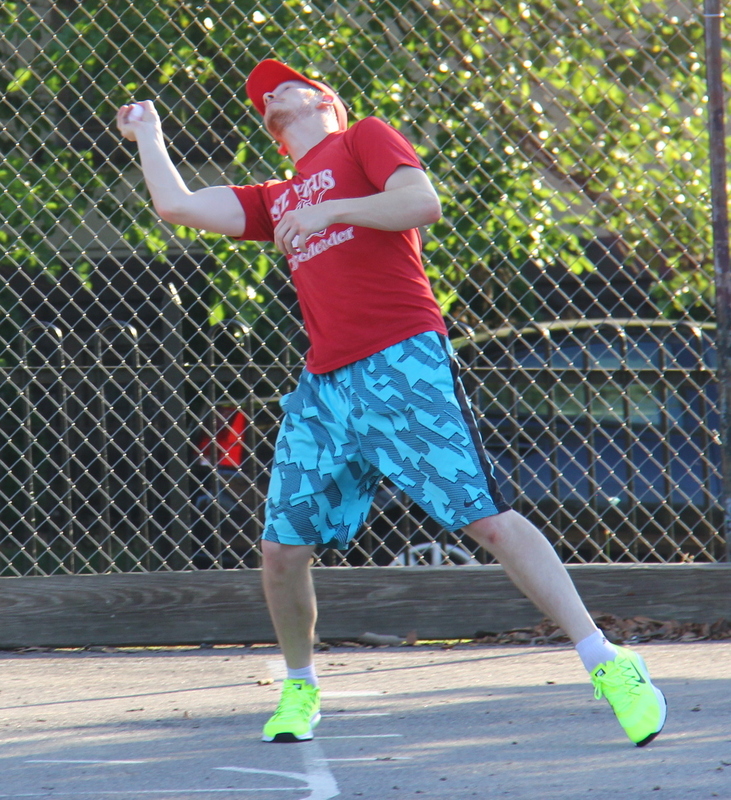 BK and Helal kept the Questionable Outfit offense in check for four innings, but as they typically do, Questionable busted out for a rally, this time in the top of the fifth. They scored four runs on four extra-base hits to take a lead, which turned out to be insurmountable, and held on to win 5-3. As a result, Questionable Outfit and Cookies & Cream would face off in the final game of the 2016 regular season to determine who would win the pennant and capture the #1 seed heading into the playoffs. Eastbound sent BK to the mound as their starter, and he was effective from the get go. He retired Bob for the first out of the inning, and after Tom singled, he was caught in between first and second by Dustin, and BK had pitched a scoreless inning. Bob took the mound for Questionable Outfit, and after giving up a leadoff single to Tim, he retired Nate and Dustin to strand the runner, and the game was scoreless after an inning. BK gave up a one-out single to Bob in the top of the second, but Questionable couldn’t drive him in, as Tom was retired to end the inning. Bob cruised through the bottom of the second, retiring the side in order, and the score remained 0-0. Bob pitched three innings of shutout ball, allowing only one hit. BK pitched a perfect frame in the top of the third, sending Miller and Bob down consecutively. Bob matched him in the bottom half of the inning, and neither team had scored through three innings. Questionable would break the scoreless tie in the top of the fourth after Eastbound removed BK from the mound and brought in Helal from the bullpen. Tom singled to lead off, and Miller drove him in with an RBI triple that made the score 1-0. Questionable had a runner on third with no outs, but Helal avoided further damage, retiring the next two batters to strand the runner and end the inning. Eastbound bounced back to tie the game in the bottom of the fourth. Helal singled with one out, and BK drove him in with an RBI double off the fence, tying the game at 1-1. Tom, who had come in to pitch in at the beginning of the inning, retired Tim to end the inning with the game tied. Questionable had been quiet at the plate to this point in the game, but they busted out in the top of the fifth. Miller led off with a triple and scored when Bob followed with an RBI triple. Tom then doubled, scoring Bob, and Questionable led 3-1. Miller followed with an RBI double, scoring Tom, and the score was 4-1. Bob hit a sacrifice fly to move Miller from second to third, and Tom hit an RBI double to make the score 5-1. Tom was caught in between second and third on the play for the second out of the inning, but Questionable had taken a four run lead. Eastbound cut into the deficit immediately in the bottom of the fourth. Dustin singled with one out, and Helal followed with a two-run homer to right-center. Tom then retired BK for the second out, and the score was 5-3 heading into the sixth. Helal made quick work of Questionable in the top of the sixth, retiring Bob and Tom, and Eastbound would trail by two in the bottom of the sixth. Helal keeps his toe on the mound while receiving a throw from one of his fielders. He was hit hard on the mound, but had a good day at the plate, going 2-for-3 with a single and a two-run homer. Miller came in to close things out, and he made it interesting. Nate tripled with one out, putting a runner in scoring position and the tying run at the plate. But Miller buckled down, and he retired Dustin for the second out of the inning. Miller had earned his first career save, and Questionable held on to win 5-3. The win moved Questionable Outfit to 15-4 on the season, and Eastbound would finish the regular season with a 2-18 record, the worst regular season record in the history of the EWL. 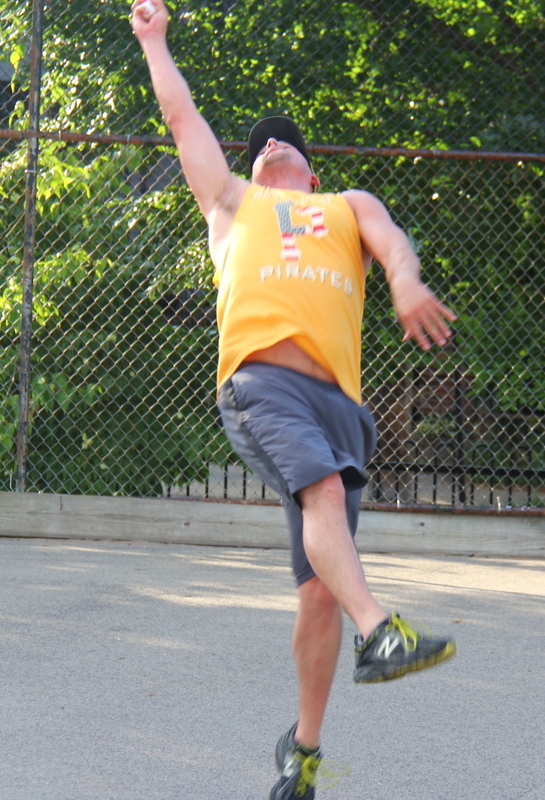 – Tom earned the win for Questionable Outfit, giving up 3 runs on 4 hits in 2 innings pitched. – Bob started the game and got the no decision, pitching 3 shutout innings while only allowing a single hit. – Miller got the save in one inning of relief, giving up 1 hit and no runs. – BK started the game for Eastbound & Dahn and got a no decision, giving up no runs and 2 hits in 3 innings. – Helal took the loss for Eastbound, allowing 5 runs on 8 hits in 3 innings. – Tom and Miller each had four hits for Questionable Outfit. Tom went 4-for-7 with a single, 3 doubles, 2 runs scored, and 2 RBI. Miller was 4-for-6 with a single, a double, 2 triples, 2 runs scored, and 2 RBI. – Helal led Eastbound & Dahn at the plate, going 2-for-3 with a single, a homer, 2 runs scored, and 2 RBI. 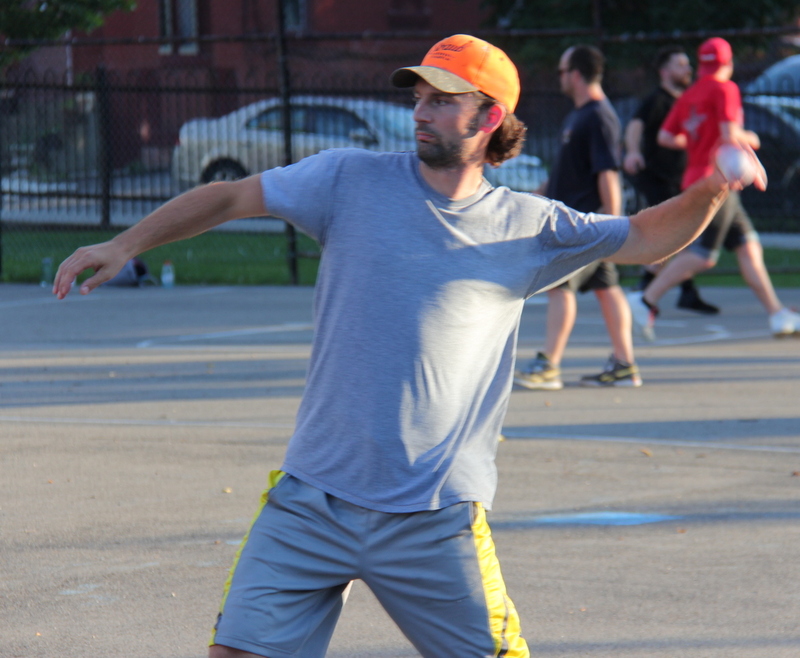 One of Eastbound & Dahn’s all-time greatest players, Tim, made his first appearance of the 2016 season after recovering from multiple injuries, and their former team captain, Helal, also made a return to the diamond, playing in his first game since week four. The result; Eastbound picked up their second win of the year, beating the Ham Slams 6-4 as all five Eastbound players had at least one hit. 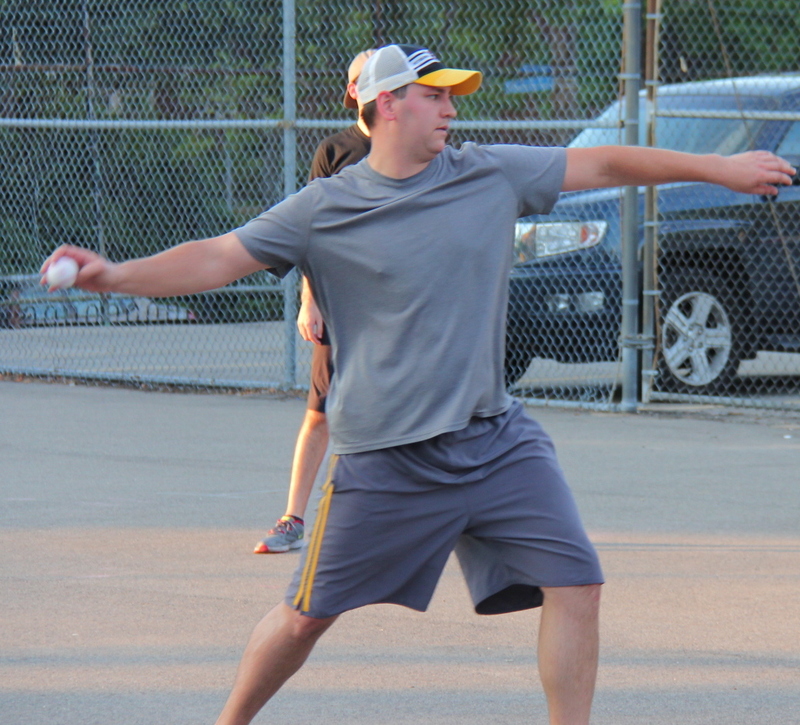 Kessler made his first appearance on the mound this season and was penciled in as the starting pitcher for the Ham Slams. He retired the side in order in the top of the first, sending Tim and Nate down consecutively. 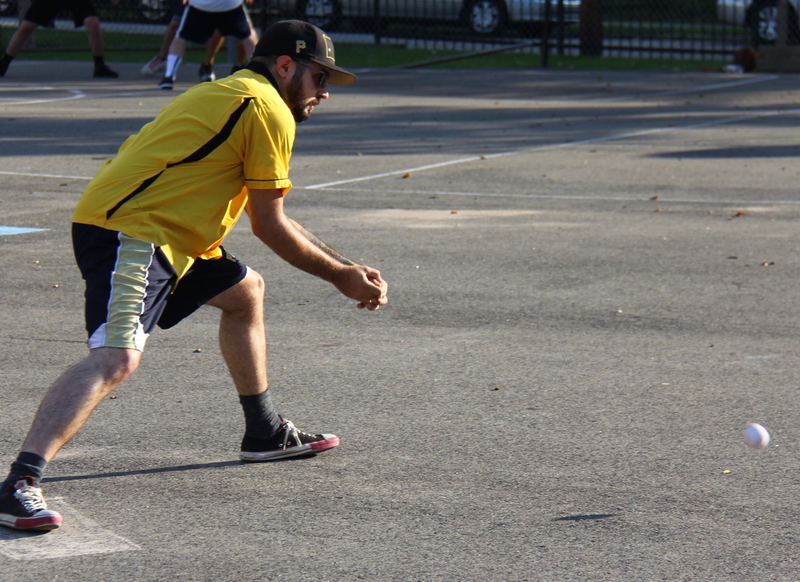 Helal took the mound for Eastbound & Dahn, and he fell behind early. Dave led off the game with a double, and he scored when Dan hit an RBI triple that put the Slams ahead 1-0. Josh then singled, but Dan didn’t score on the play, putting runners on the corners. The Ham Slams were threatening, but Helal escaped the jam, retiring Kessler and Dave to strand both runners and minimize the damage to a single run. Kessler continued to roll in the top of the second, sending Dustin and Kyle down, and the score remained 1-0. 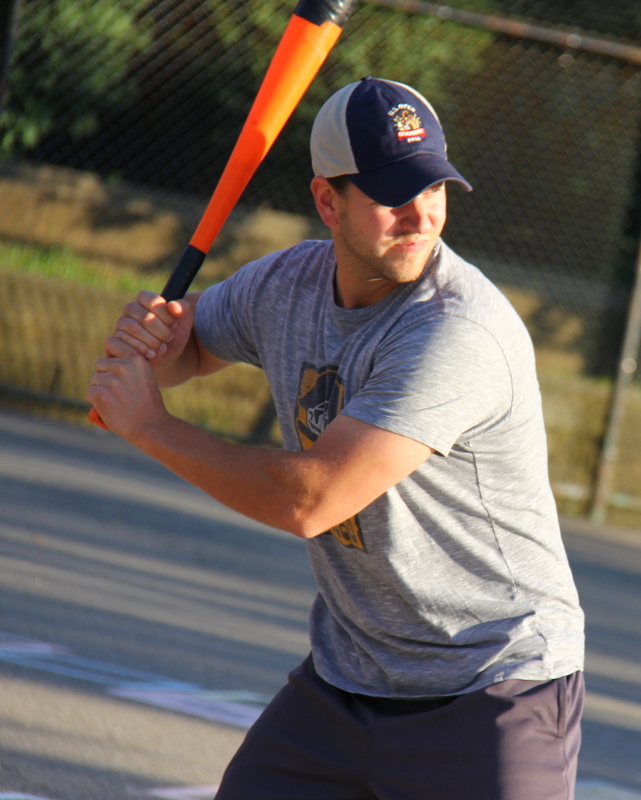 Dan tripled for the second consecutive at-bat to lead off the bottom of the second, but once again he was stranded at third, as Helal retired Josh and Kessler to end the inning. Eastbound would get on the board in the top of the third. BK singled to lead off, and two batters later, Nate crushed a two-run homer to left, putting Eastbound ahead 2-1. 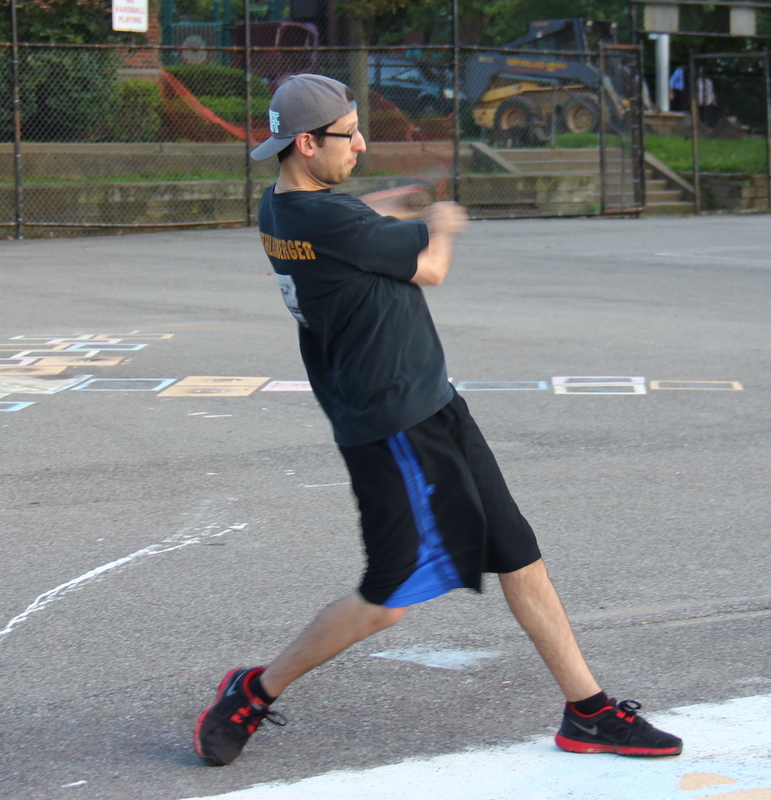 Dustin followed with a single, but Kessler avoided further trouble, retiring Helal to end the inning. The Slams bounced right back in the bottom of the third, reclaiming the lead. 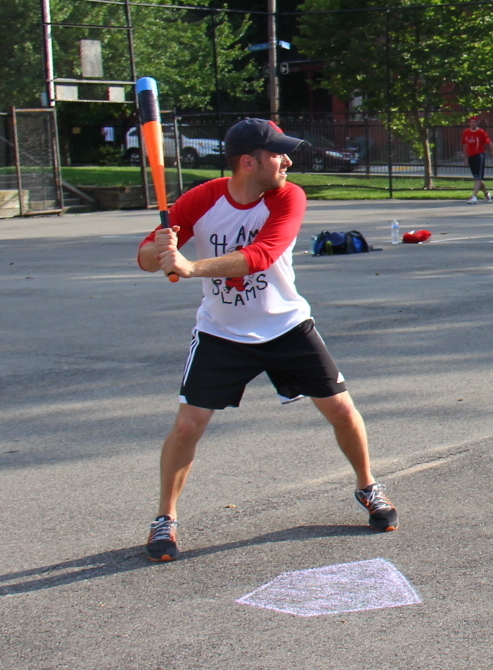 Dave tripled to get things started, and Dan followed with a two-run shot, giving the Ham Slams a 3-2 lead. Two batters later Kessler doubled with one out, but the Slams couldn’t add more runs, as Helal retired Dave for the second out of the inning. 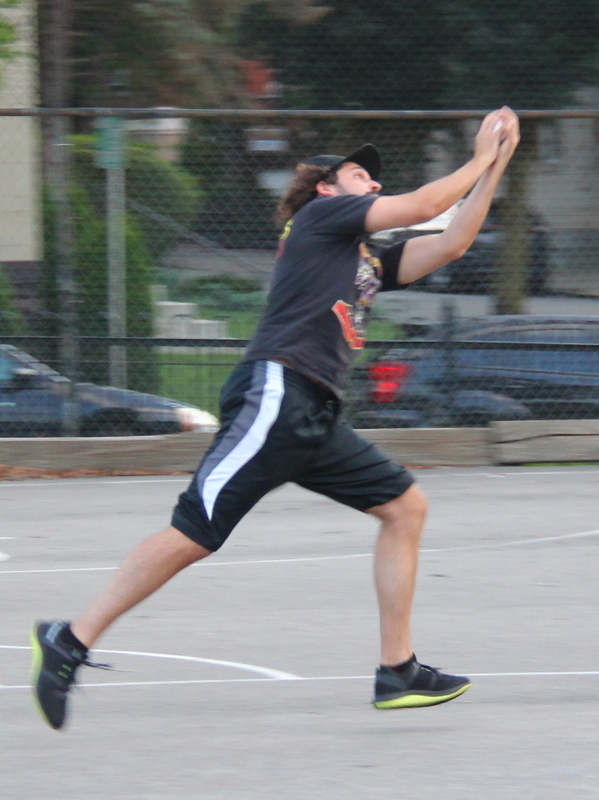 Dave, who has replaced Tim on the Ham Slams roster, makes a play in the field. He went 3-for-6 with a single and 2 doubles. The back-and-forth battle continued in the top of the fourth, when Eastbound & Dahn bounced back to take the lead. BK singled to start the inning, and Tim followed with his first hit of the 2016 season, a two-run homer that put Eastbound ahead 4-3. Kessler struck out Nate and retired Dustin to end the inning, and the Ham Slams trailed by one. Josh singled with one out in the bottom of the fourth, and he scored from first when Kessler hit an RBI double that tied the game at 4-4. BK, who had come into the game in relief for Helal, retired Dave for the second out of the inning. Helal started the top of the fifth with a single, and two batters later, Tim hit an RBI double, scoring Helal to put Eastbound back on top 5-4. Kessler retired Nate for the second out of the inning, and the Slams had fallen behind once again. Josh hit a one-out double in the bottom of the fifth, but BK maintained the lead, retiring Kessler for the second out of the inning and stranding the tying run at second. Eastbound would add an insurance run in the top of the sixth when Helal hit a one-out solo homer, putting his squad up 6-4. The Ham Slams would be down by two runs heading into the bottom of the sixth. Dave led off the final frame with a single, and he moved from first to third when Dan grounded out for the first out of the inning. 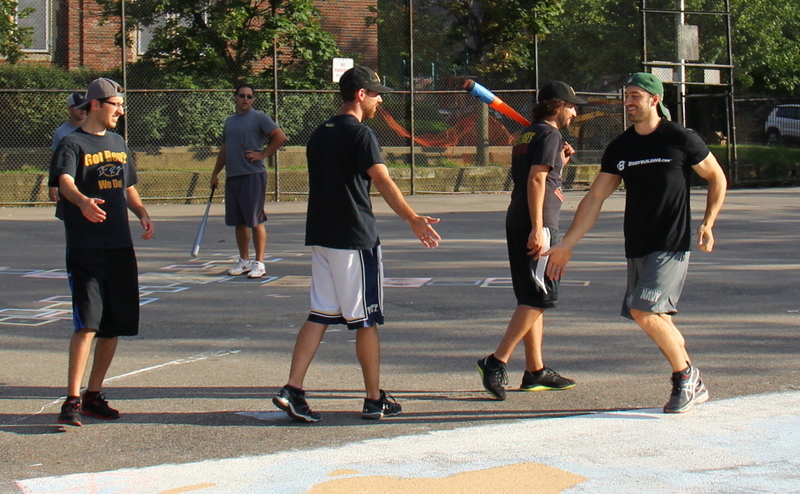 The tying run was at the plate, but BK shut the door, retiring Josh to end the game and give Eastbound & Dahn a 6-4 win. 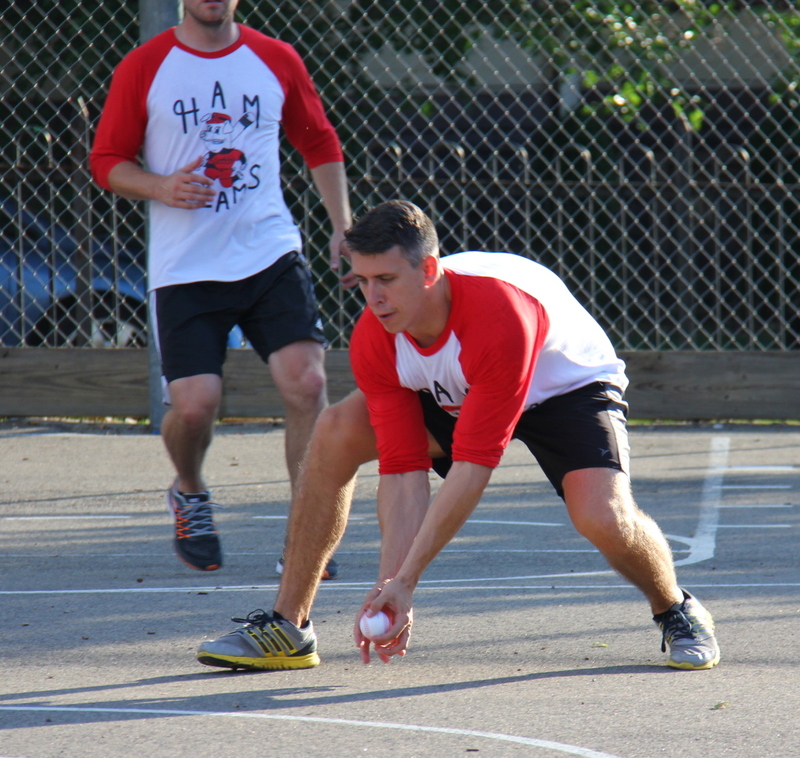 The win moved Eastbound to 2-17 on the season, and the loss dropped the Ham Slams to 8-12. 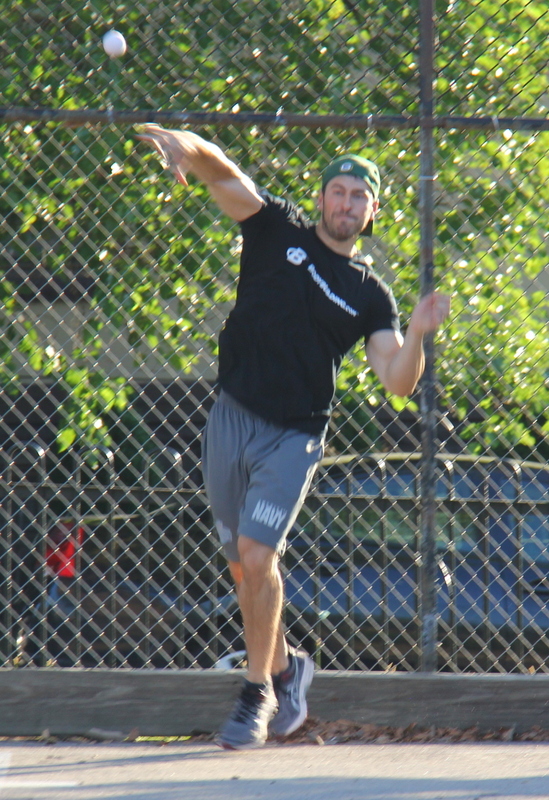 – BK earned the win for Eastbound & Dahn, and allowed 1 run on 4 hits in 3 innings pitched. – Helal started for Eastbound and took a no decision, giving up 3 runs on 7 hits in 3 innings. 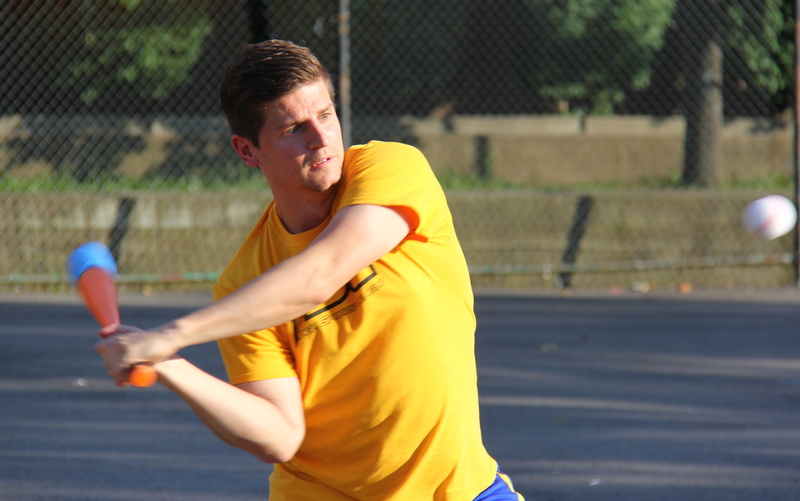 – Kessler took the loss for the Ham Slams, allowing 6 runs on 8 hits in 6 innings with one strikeout. – Tim led Eastbound & Dahn on offense, going 2-for-4 with a double, a homer, a run scored, and 3 RBI. – Helal also went 2-for-4 for Eastbound with a single, a home run, 2 runs scored, and one RBI. 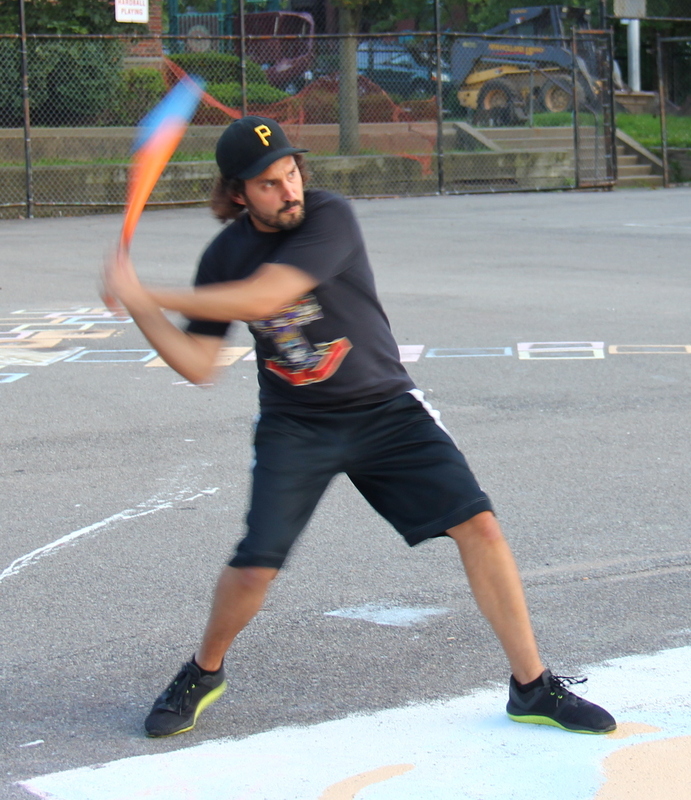 – Dan led the Ham Slams at the plate, going 3-for-6 with 2 triples, a home run, a run scored, and 3 RBI.